We currently have a limited number of breeding quality boars available. 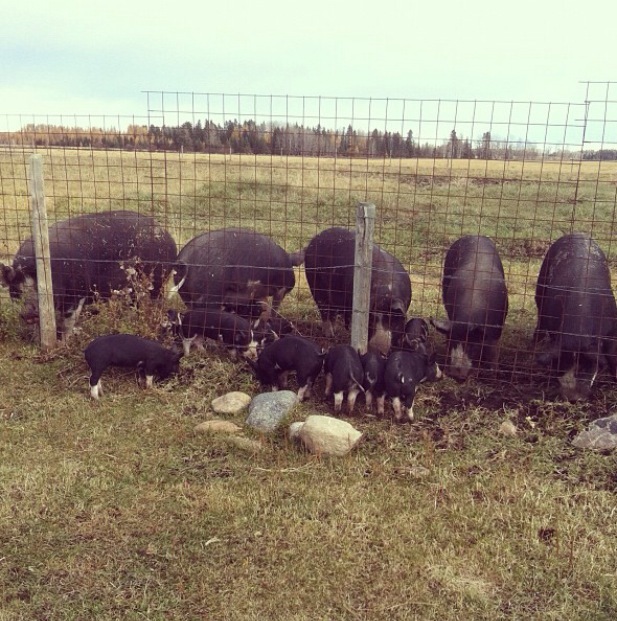 What is included in purchase: One healthy, happy Berkshire hog complete with registration papers, CLRC transfer, Pig Trace tag and lifetime support from breeder with any questions or concerns. We currently have 1 registered Nigerian Dwarf yearling doe available. Purebred and registered Nigerian Dwarf doeling. She is petite, correct and adorable. Black with white spots and brown eyes. Sire is blue eyed, dam is brown eyed. Price includes full registration. She is only offered for sale because she is related to both of our herd bucks and she is too nice to leave open this year. A great start to a purebred program. She is not eligible to show due to her horns. Both of her parents health tested negative for CAE, Johnes and CL via bloodwork October 2017. What is included in purchase: One healthy, happy goat complete with registration papers, CLRC transfer and lifetime support from breeder with any questions or concerns. We have a variety of pedigreed rabbits for sale at this time. 2018 Bucks – broken black otter, seal, tort tri, chocolate silver marten, chocolate chinchilla, broken black, REW, blue Cal, broken blue, blue otter. 2018 Does – tort tri, chocolate silver marten, chocolate chinchilla, broken black, REW. Please let me know which colours interest you and I am happy to get current pictures, weights and pedigrees. These juniors are weaned and ready to go. We are happy to support our future farmers by supplying one free project rabbit per year. What is included in purchase: One healthy, happy rabbit complete with pedigree and lifetime support from breeder with any questions or concerns. We require a 50% non-refundable deposit to hold the animal of your choice. Should your first choice not be available you may transfer your deposit to another animal of your choice. Cancellations are not refunded. Purchase price includes registration and transfer, unless otherwise stated. We have been so frustrated in our own experience buying stock and waiting (sometimes for years) for registration papers. This can wreak havoc on a purebred breeding program and I don’t wish this hassle upon anyone. I will do my best to ensure that everything is in order before the animal leaves the farm and mail the papers to you myself as soon as the transfer is completed by the CLRC. Additionally, I ensure I will provide you with a proper bill of sale, manifest, RFID tag etc. (depending on species) when you arrive for pick up. I will also send health records with all stock. We cannot hold your choice of animal indefinitely without a deposit. Please don’t be upset when we sell “your” animal to someone else if you haven’t sent a deposit and arranged pick up within a reasonable amount of time. Animals left in our care beyond reasonable pick up dates will be charged daily room and board and likely be put to work washing dishes and minding the children 🙂 I am very flexible with providing care and arranging a convenient pick up time but please don’t leave the critter here for months without making arrangements. We charge board at a flat rate of $5/day for small stock and $10/day on cattle and horses. Balance of payment is due prior to pick up at the farm. We currently have healthy herds on our farm and follow preventative measures to ensure optimal health of our animals, however, we cannot guarantee their health status once they have left our farm. We practice quarantine procedures when introducing new animals to our farm and we encourage you to do the same. We guarantee all breeding stock to be fertile. We will replace any animal returned with written veterinary letter indicating a congenital defect as cause of the infertility. We cannot guarantee reproductive performance of our stock as success is based on many factors, such as management, stress, nutrition and herd health, which we cannot control after the animal has left our farm. We cannot guarantee that animals will mature into show quality animals as there are many factors (ie. nutrition, husbandry) that are beyond our control once an animal has left our farm. We request that you keep in touch with us as we love to hear the progress and accomplishments of animals we’ve raised. We encourage you to contact us at any time with any concerns or problems that you may have. We strive very hard to ensure success for those who purchase stock from us. If we do not have what you are looking for we will try hard to put you in touch with someone who does. Unless otherwise stated all sales require on farm pick up. We can meet you somewhere along the route or deliver for a fee (gas + time). Ensure that you are properly equipped to transport your livestock safely and humanely. Weaner pigs, rabbits, poultry and goat kids can be safely transported in an appropriately sized hard plastic crate. An appropriate horse/stock trailer or stock racks is required for anything larger than this. Please do not ask us to send you on your way with a goat riding on the front seat or pigs in the trunk. Animals need protection from the elements, adequate space and stops to rest, eat and drink as necessary. We cannot and will not accommodate any slaughter on site. Please don’t ask us to make an exception. We are more than happy to arrange delivery to the local slaughter house. Please let us know what you will be bringing to transport your livestock home in as it will dictate how we set up the loading ramp. We are happy to assist in arranging professional transport with a livestock hauling company if you prefer.